For some of you, spring is already here, and for others, it’s right around the corner. Whether you look out your window and see new buds on the trees, or piles of snow, the official first day of spring is fast approaching! Get ready by making some cute and inexpensive DIY spring decor using materials from the dollar store! 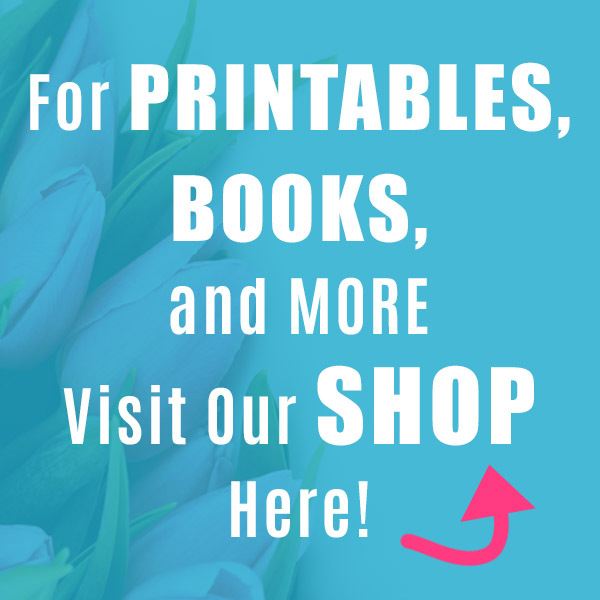 Here are 10 adorable DIY Dollar Store Spring Crafts! 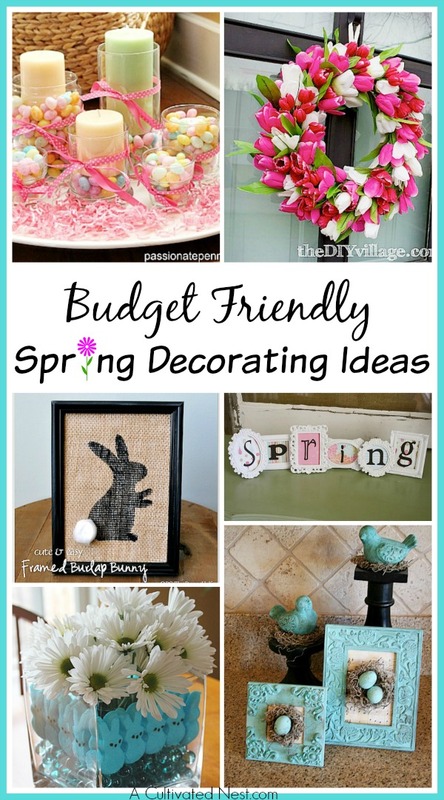 Enjoy these simple budget friendly spring decorating ideas! This pretty wreath is inexpensive, and easy to make! 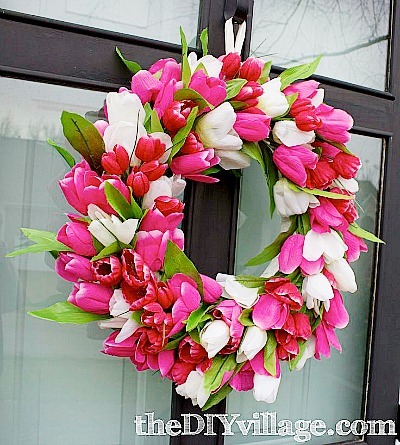 The DIY Village shows you how to combine dollar store tulips with a few other materials to make your own tulip wreath! This cute DIY “Spring” frame project by A Diamond In the Stuff can easily be customized with your own favorite scrapbook paper and font! This is such a cute and easy DIY project! 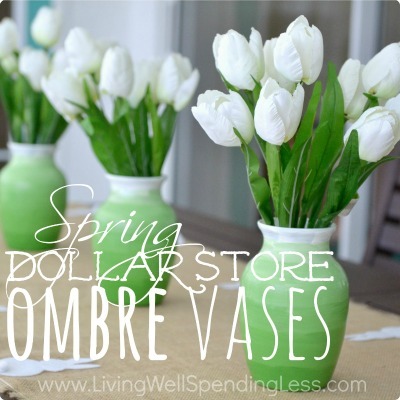 Living Well Spending Less shows you how to take a dollar store vase and some paint and make a beautiful spring ombre vase! 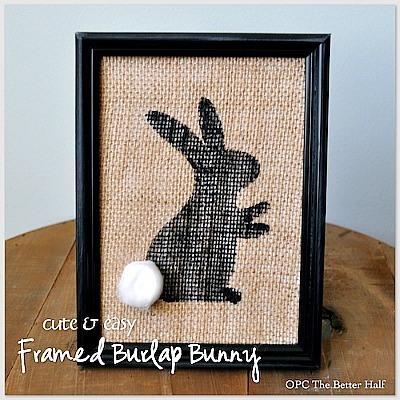 One Project Closer shows you how to make an adorable bunny silhouette in a dollar store frame! This super cute project is a plastic egg makeover! 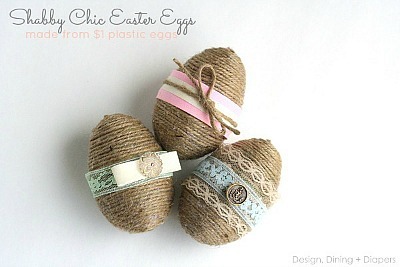 Design, Dining, and Diapers shows you how to make your own pretty Shabby Chic jute eggs with just a few materials! 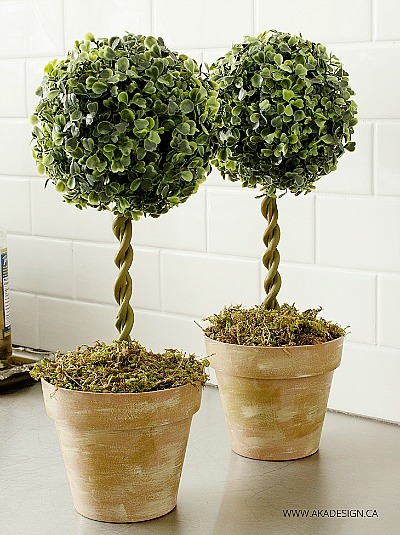 It’s hard to believe that these cute faux topiary trees are made completely with dollar store supplies, but they are! Follow Aka Design’s tutorial to make your own dollar store topiary! I love simple DIYs like this! The Gathering Place Design’s tutorial shows how to take a wastebasket and a few other materials to make an adorable cloche! 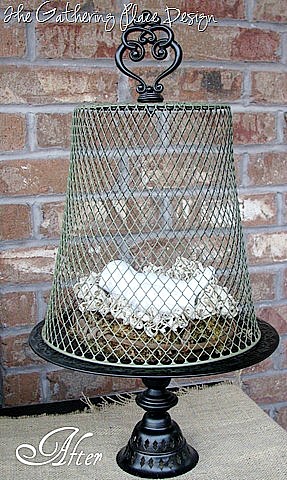 Put a nest and bird under it and you have a lovely spring decor item. This DIY may look involved, but it’s actually very simple! 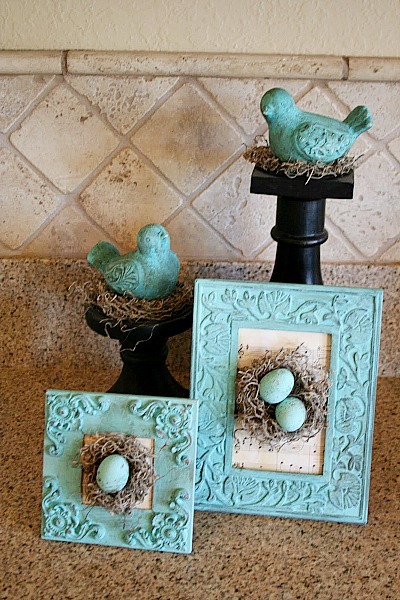 Cinnaberry Suite shows how to use dollar store supplies to create beautiful bird and egg decor! This cute DIY project is easily customized by choosing different colored Peeps and decorative glass! 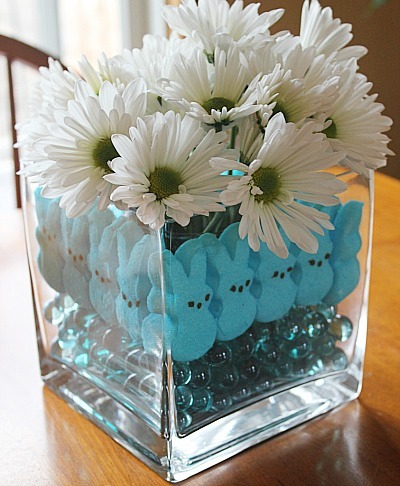 Follow Kimberly Danger’s tutorial on Mommy Savers to make your own Peeps Easter centerpiece that can hold some pretty fresh flowers! Don’t want a floral Easter centerpiece? Try using jelly beans and candles instead! Follow Passionate Penny Pincher’s tutorial to make your own colorful jelly bean Easter centerpiece! DIY projects don’t have to be pricey! It’s amazing how many great supplies you can find at the dollar store for spring crafting. You can find other cute supplies in the dollar bins in other stores too, like at Target or Michael’s. 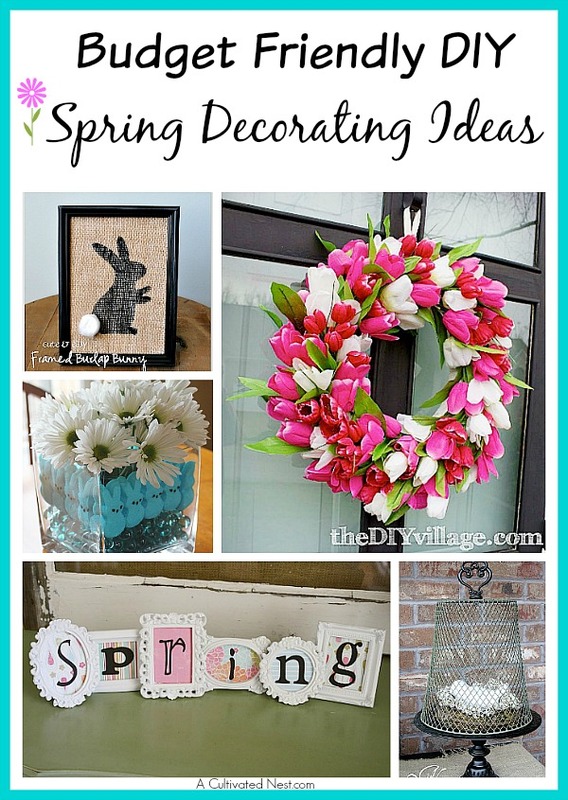 Which of these dollar store spring crafts do you want to try first? SO cute! 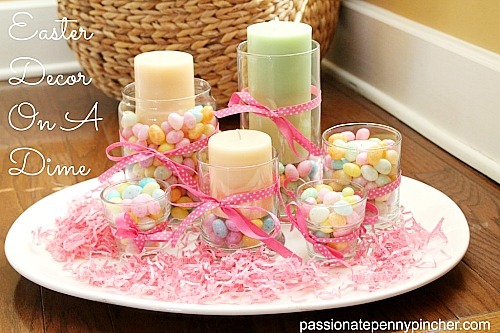 Thanks for sharing these simple and inexpensive Easter/Spring projects! Have a beautiful day dear Manuela, HUGS! So many cute ideas – thanks for sharing. I have not thought about decorating for Spring just yet . Glad to see the snow and ice gone from this last Winter storm. Sweet ideas! thanks for sharing them. 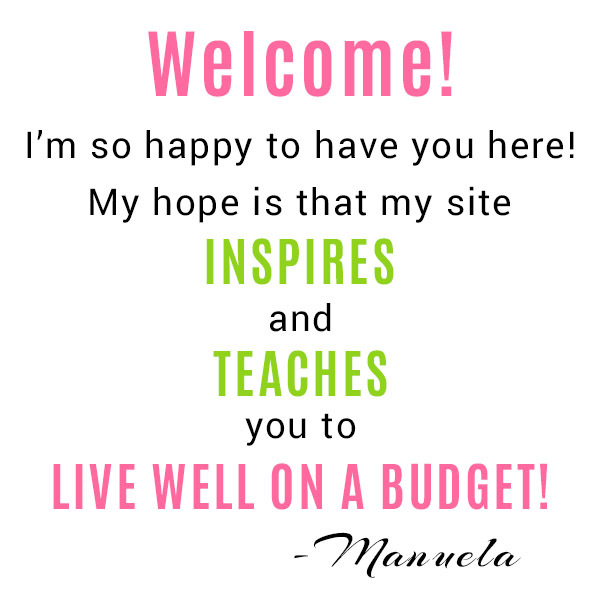 Such cute and great ideas, Manuela! I love that these are dollar store purchased supplies, too. 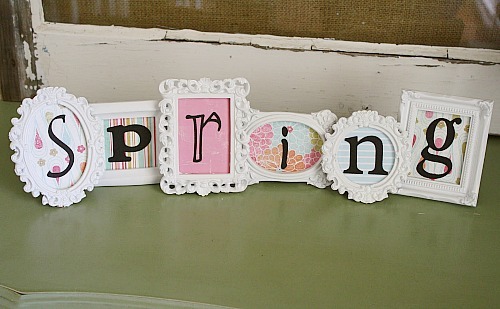 I think I have a bunch of frames from the dollar bin at Michaels to do that Spring sign. I am not a great crafter so I don’t like to spend a lot of money on craft supplies. 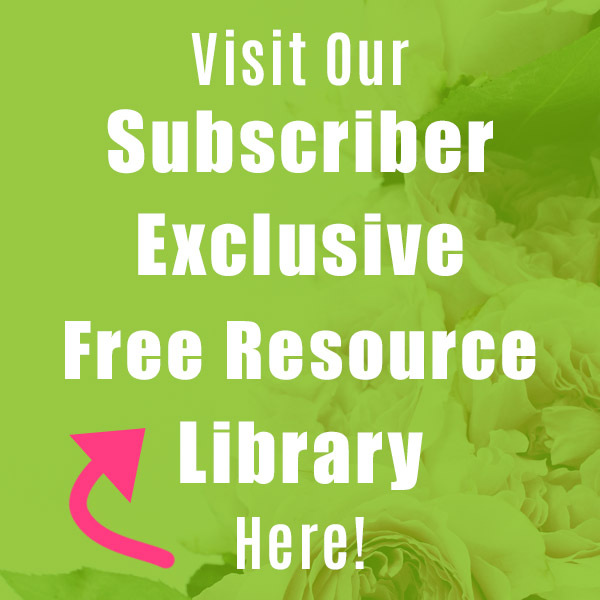 So glad I saw your post at Spring Fever with Inspired Bloggers Network! Looking forward to trying some of these. Great collection of ideas, I especially like the topiary trees, I’m off to check them out now. Wonderful Spring inspiration!! 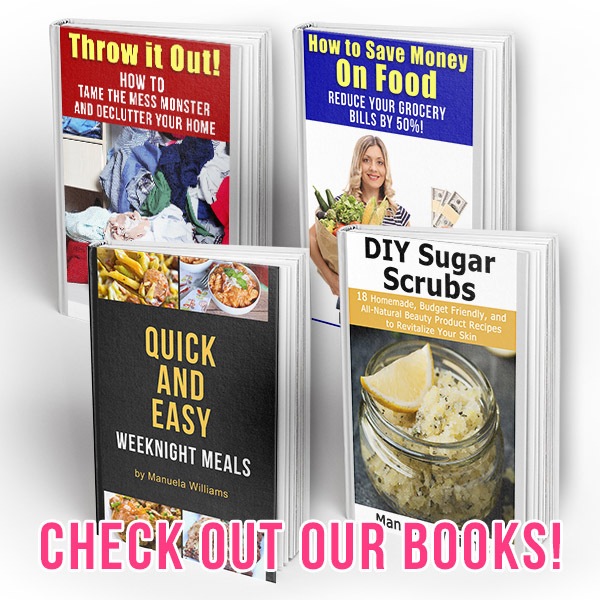 Thank you so much for sharing at The Wonderful Wednesday Blog Hop!!! I’m definitely pinning this to our board!! Great ideas. Thanks for sharing. Dollar store is one of my favorite places to hit before I do more expensive stores. Why spend if you don’t have to right? Fab ideas! Thanks for sharing your crafty inspiration on this week’s Monday Funday Party! These are super cute and Spring festive!! Great round up! Lots of cute ideas in here. Poppin’ over from the Worthwhile Wednesdays link party.